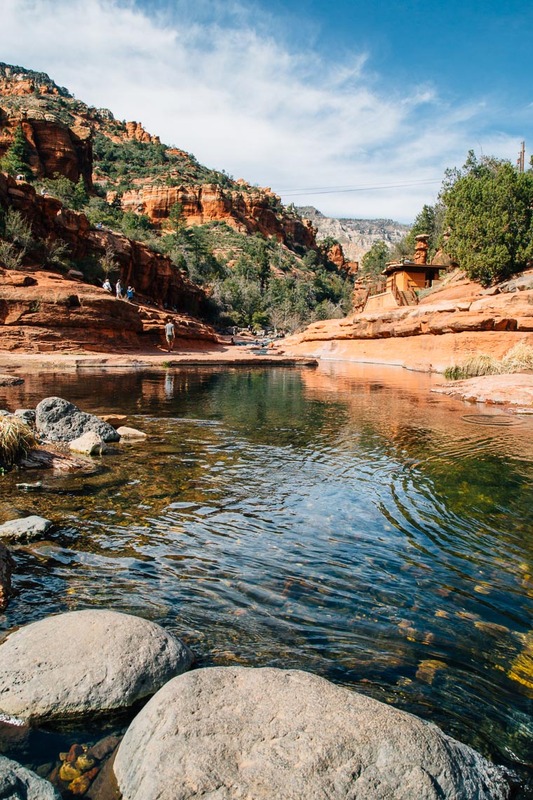 Grab your bathing suit and towel, because we just spent a week scouting out the best swimming holes in and around Sedona, AZ. Even though we visited in early spring, the weather was already starting to warm up quite a bit. After a long cold winter, many of the locals had Spring Fever and were more than ready to break out the tank-tops and flip-flops. The trees didn’t have leaves yet and the water was still pretty chilly, but that didn’t stop us from getting into the summer spirit. 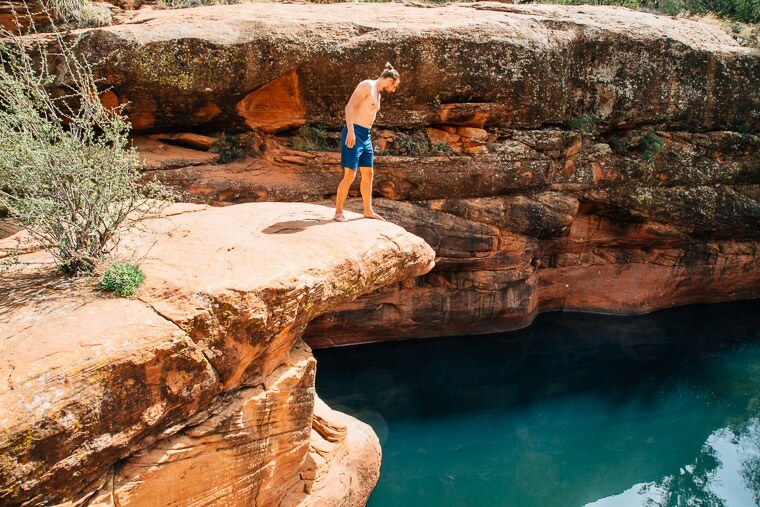 While we experienced these spots at the very start of the season, once summer rolls around and the temperatures start to rise, these swimming holes will be the place to be. 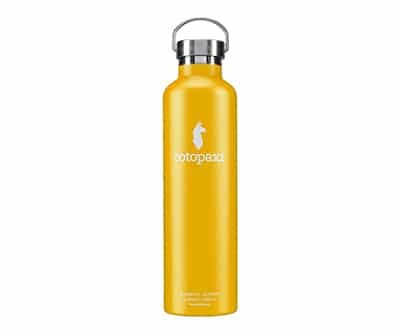 Cell phones and GoPros have a bad habit of running out of juice just when you need them most. 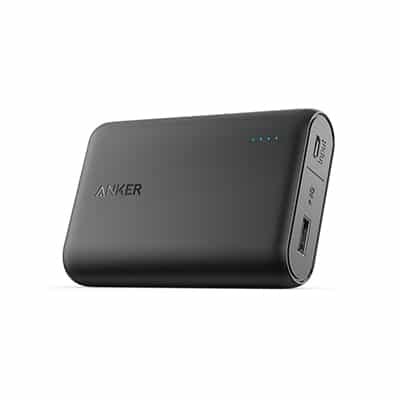 We charge up this portable battery stack before we go on a hike in order to give our devices extended life. 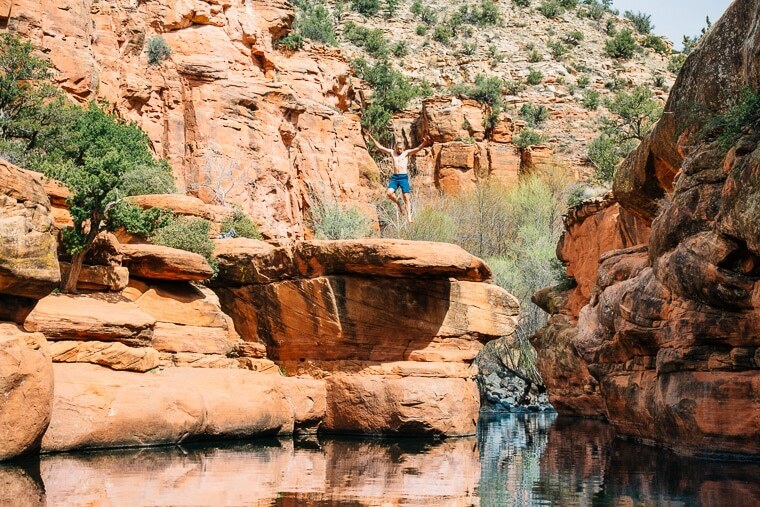 We wouldn’t jump into a swimming hole with any other camera. 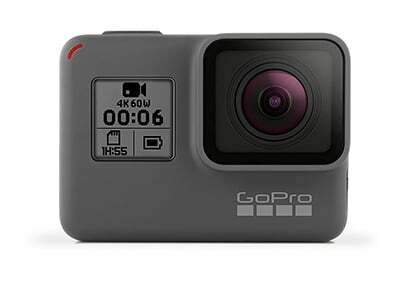 Smaller than a cellphone and about a thousand times more durable, the GoPro is our go-to watersport camera. 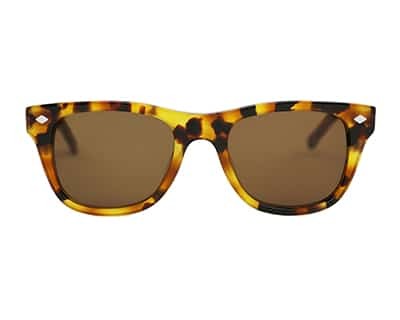 We recently received these sunglasses from J Martasand and have been loving them ever since. Clean, simple design with exceptionally sharp lenses. We received this sunscreen as a gift from Coast to Costa for our Cuba trip back in March and it’s the fanciest sunscreen we’ve ever used. 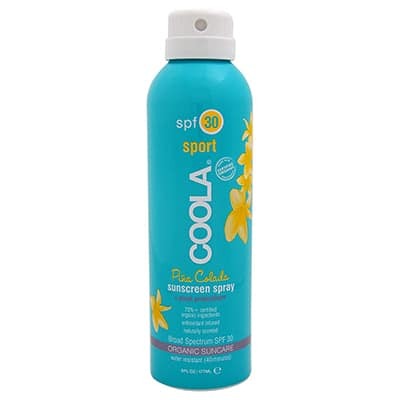 This 100% organic, Farm to Face™ (we’re not kidding) sunscreen from Coola offers SPF 50 protection in an easy to apply spray. 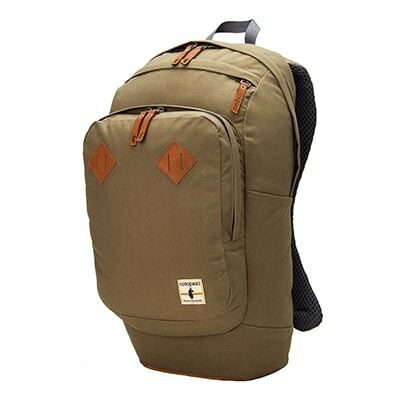 This is our go-to day hike bag. 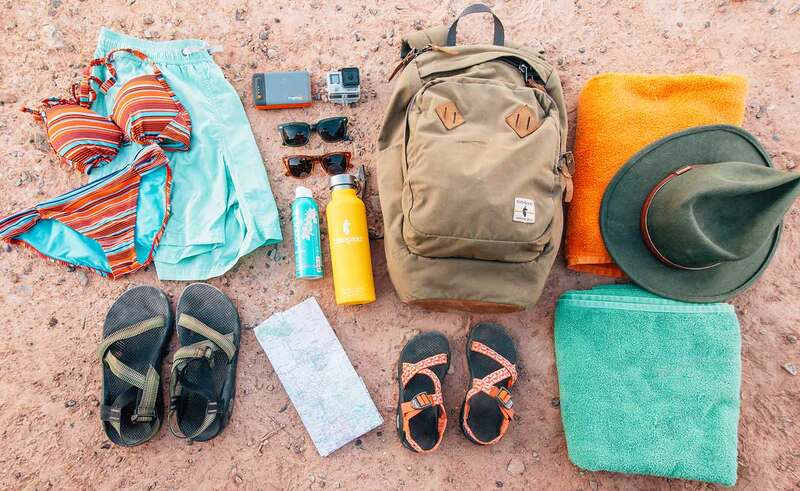 Perfectly sized for for scouting out swimming holes, it has plenty of room for towels, sunscreen, and snacks without feeling bulky. 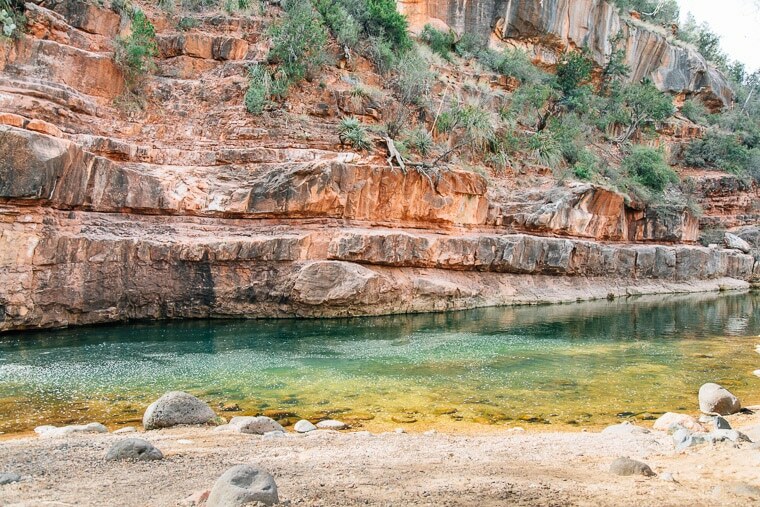 You don’t need a fancy towel to go to a swimming hole, but if we could, we’d want to take this southwest themed one from Nomadix! 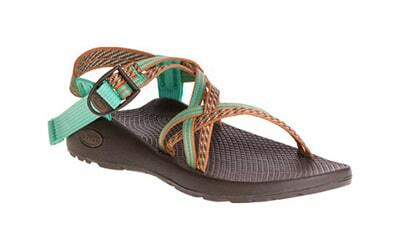 We wear our Chaco Z/1 pretty much everywhere! But they are especially useful when climbing around wet, slippery rocks or crossing a stream. While the town of Sedona has decent cell coverage, once you get into canyons things can get a little spotty. 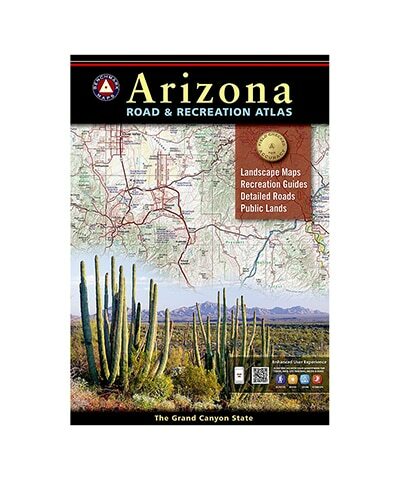 This recreational map of Arizona is filled with helpful information like campgrounds, topography, drivable roads (by classification), trailheads, water sources, and much more. 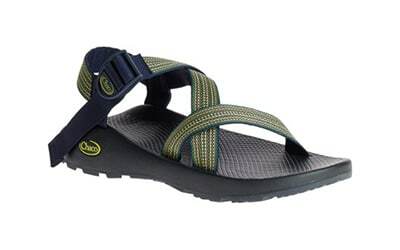 We wear our Chaco sandels pretty much everywhere! 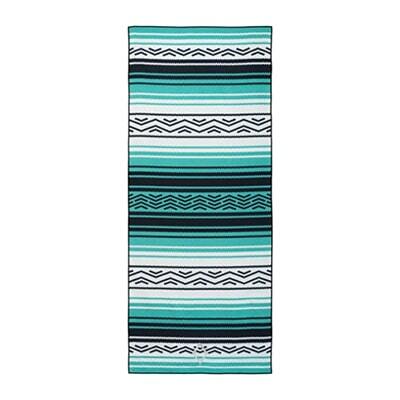 But they are especially useful when climbing around wet, slippery rocks or crossing a stream. The Vibe: This fairly popular day use area offers a wide range of swimming, sunbathing, and cliff jumping options. It’s located along a bend in Oak Creek, which means it can remain shady until midday: a positive if it’s hot, a negative if it’s chilly. There are couple of different spots within walking distance from the parking lot, including a few deep sections for swimming, red rock terraces for laying out, and a variety ledges to jump off of. So if one area is busy, then it’s easy to move to another. Parking: There is a small parking lot that can fill up quickly during the summertime and on weekends. There is a $8 day pass fee per vehicle (5 people) and $2 for a walk-in, bicycle, extra person. However, the fee can be avoided if you park along the side of 89A and hike down on Midgely Bridge Trail. How to find the spot: From the parking lot, the swimming holes are just a short walk up Allen’s Bend Trail, which can be picked up at the north end of the parking lot. There ara e variety of different sections along the creek, some of which might require a little bushwhacking to get to, but most of them are within a ¼ mile of the parking lot. 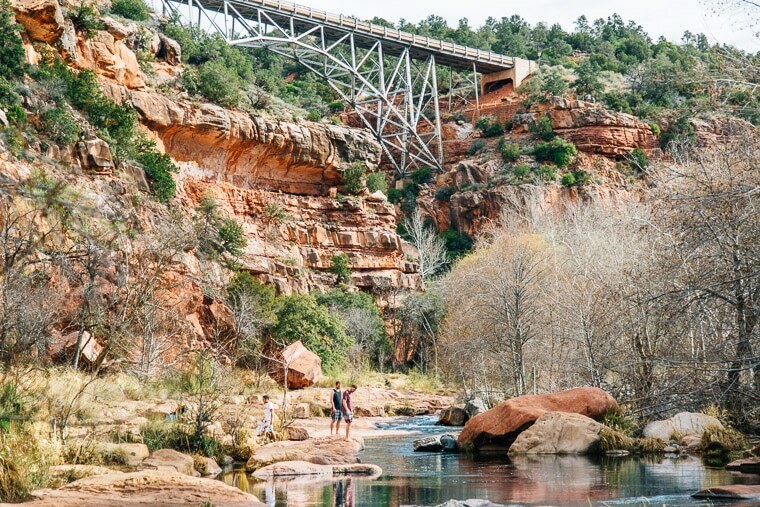 The Vibe: If you’re visiting this swimming hole on a weekend during the academic year, there’s a good chance you’ll be sharing the trail with more than a few college kids, as they drag their ice-filled coolers and intoxicated friends down to the creek. This spot definitely had a “Spring Break” vibe to it, which can either be a plus or a negative, depending on what you’re looking for. 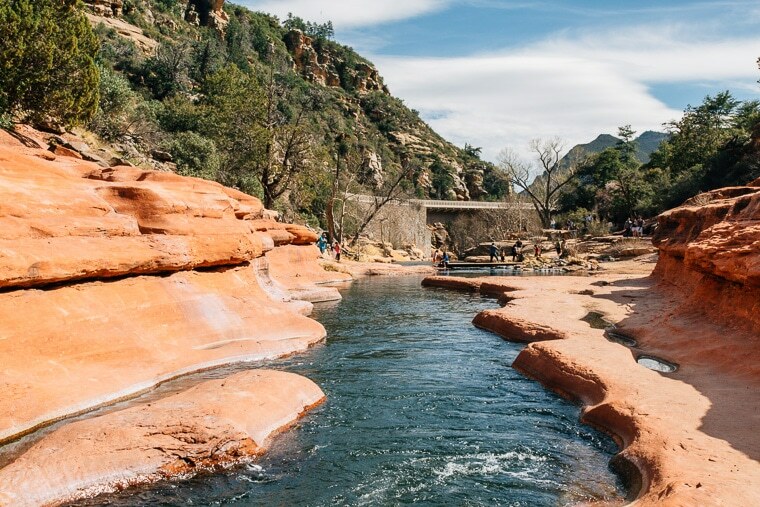 This section of Oak Creek has some deep sections for swimming, but the main attraction are the large red rock “beaches” that are perfect for laying out. Where to Park: There is a comically small parking lot at the north end of Midgely Bridge, which can hold about 20 vehicles. If you plan on parking here, we suggest arriving very early. A Red Rock Pass ($5 per day / $15 per week) or a valid National Park Interagency Pass must be displayed. There is a pay kiosk located at the end of the parking lot that takes credit cards, across from the vault toilet. If this parking lot is filled up or you’re unwilling to pay the fee, you can attempt parking to the north of the bridge, on the west side of 89A. We’re not sure if this is entirely legal, but we saw dozens of cars parked along the side of the road on a Saturday. How to find the spot: From the parking lot, there is a trail that leads down underneath the bridge called the Midgely Bridge Trail. Just underneath the bridge there is an overlook, where you can see the swimming area to the south. Follow Midgely Bridge Trail and then take a right onto Huckaby Trail. This will lead you down to Oak Creek, but the swimming hole is actually further downstream. Follow the stream, passing the bridge on your right, until you see the large red rock “beaches”. Chances are there will already be a bunch of people over there. 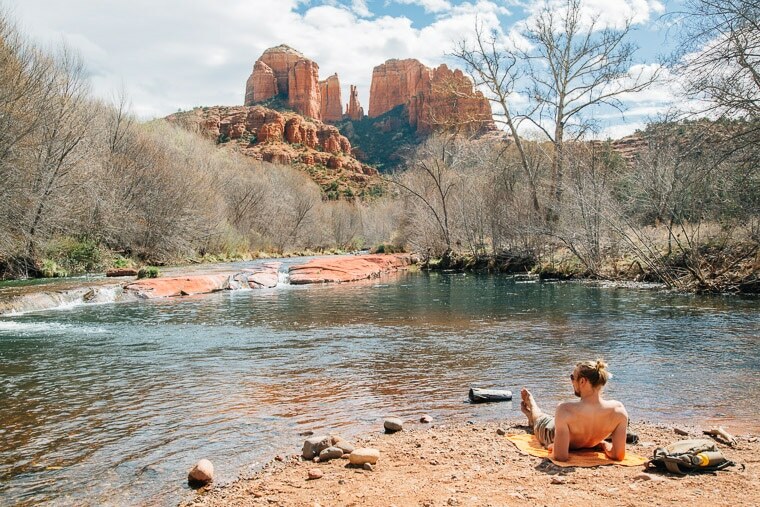 Vibe: Perhaps the most popular and well-known swimming hole in Sedona, we couldn’t leave this classic off the list. This area is heavily frequented by tourists and for good reason: it’s absolutely beautiful. The red rocks closes in tight around Oak Creek, creating narrows with mini cascades and water slide chutes. Underneath the bridge, there are cliffs of varying heights that can be jumped off of, depending on the water level. 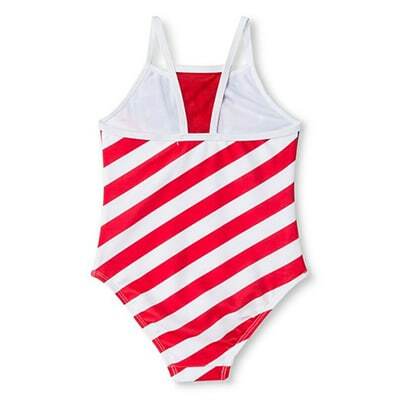 There are many shallow areas for children as well as a few deeper sections if you’re looking to get fully submerged. Parking: Slide Rock State Park has it’s own dedicated parking lot which cost $10 per vehicle (cash only). Again, this park is very popular during the summer, so parking might be limited. But if you’re like us, and want to avoid paying for parking at all costs, there’s a secret access point. About 0.5 miles north of the park entrance, on the west side of 89A, there is a large turnout that can accommodate four to five cars. There is a trail that leads parallel to the road, down the to bridge. From there you can access Slide Rock. How to find the spot: If you’re starting from the Slide Rock Parking Lot, then follow the paved and extremely well marked path down to the bridge. All the popular swimming areas are upstream from the bridge. If you’re starting from the the turnout on 89A, follow the trail down towards and across the bridge. The Vibe: The swimming hole at Red Rock Crossing wins for having the best view. We can think of no better way to spend the day than hanging out by the creek and looking up at Cathedral Rock. While this park is not as touristy as Slide Rock, it is still very popular. A good place families with children, there are a variety of beaches and shallow swimming areas. While there aren’t any cliffs, there are a few prominent rocks to be jumped off of. Parking: Most people pay for parking at the Red Rock Crossing picnic area ($10 cash only), but we took the trouble of finding a cheaper parking alternative. Our solution was to approach the park from the other side of the creek, by parking at the Baldwin Trailhead. You’ll need to display a Red Rock Pass ($5 per day / $15 per week) or a valid National Park Interagency Pass. From here, you can take Baldwin Trail down to Red Rock Crossing Trail. You’ll be on the opposite side of the park, but that’s nothing a little dip in the creek can’t fix. How to find the spot: From Baldwin Trail parking lot, cross the road and follow Baldwin Trail north until it links up with Red Rock Crossing Trail. There are a few swimming spots along the creek in both directions. Since this side of the creek isn’t the official park, you may need to do a little bushwhacking to get to them, though most of the trails are fairly easy to follow. 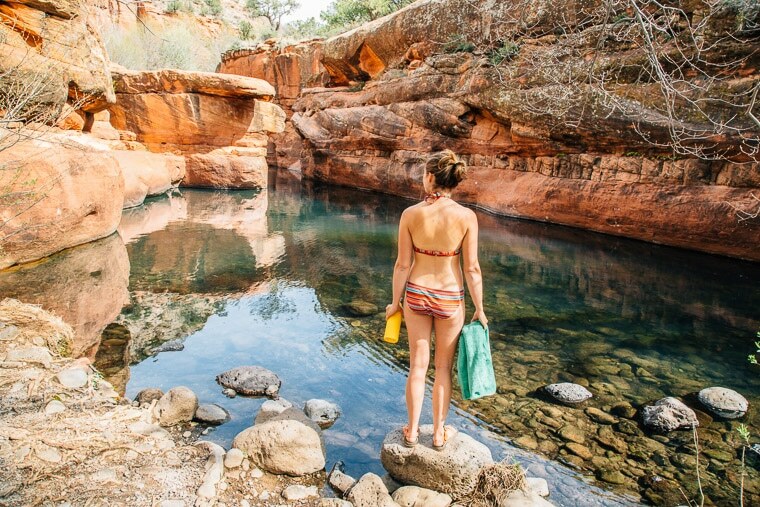 The Vibe: First off, this swimming hole has the best name ever. Thank you unsuspecting pioneer person who named the creek and snickering college kid who named the swimming hole. Great team effort! So unlike the other swimming holes on this list, this one requires a bit of a hike to get out to. While the 3.3 mile trail out only has 500 ft of elevation gain, it is largely exposed, which could make it brutal during the heat of summer. You’ll definitely want to apply some sunscreen and bring along some water for this one. But those who make the trek out will be well rewarded: because this swimming hole was amazing. The Crack has the perfect combination of deep water for swimming, smooth rocks for laying out, and lots of cliffs to jump off. In fact, this spot features a natural stone diving board locally known as “the tongue of the beaver” that thrill-seekers can fling themselves off of. While the hike out will deter the more casual swimming hole goers, there will still be a decent amount people out there. Camping is not permitted within a ½ mile perimeter of the swimming hole. Parking: Off of Forest Service Road 618, there will be signs for Beaver Creek Work Center. Turn here and there will be a well-marked parking lot for Bell Trail. There’s no fee or pass required to park at the trailhead. How to find the spot: From the parking lot, follow the signs for Bell Trail. When Weir Trail breaks off to the right, stay to the left to keep on Bell Trail. Right before trail descends to cross the creek, there will be a fork with a rock cairn. Stay to the left there too. That will bring you directly to The Crack. I’m from Austin and love Hippie Hollow. Are there any clothing optional swimming places around Sedona, please? Verde Hot Spring may be what you are looking for. Hi there! I am heading to AZ in May and staying in the Village of Oak Creek. I was hoping to do a road bicycle ride from Village of Oak Creek to Slide Rock State Park. Do you have any insight on the road conditions on Highways 179 and 89a? Thanks! I’ll be in flagstaff/Sedona for a couple days. what is a good water spot that’s not to far and easy to get to? Hey there! I LOVE this post! I’m planning on going down to Arizona this coming month for my Soeing break. I’ll be there the middle of March (around the 10th. Do you think that the water at these holes would be too chilly to jump in and enjoy? I’ve been to a couple of these and they were perfect in June. What about March? The water will probably be pretty cold in March. But you’ll be in good company. All the North Arizona University come down from Flagstaff as soon as the weather gets even just mildly warm. Very detailed post. You guys did a great job! I have a child in a wheelchair. Which of the swimming holes is ‘mostly’ flat from the parking lot to the hole? It does not have to be perfect, I can maneuver him over logs, and gravelly bumps is fine. 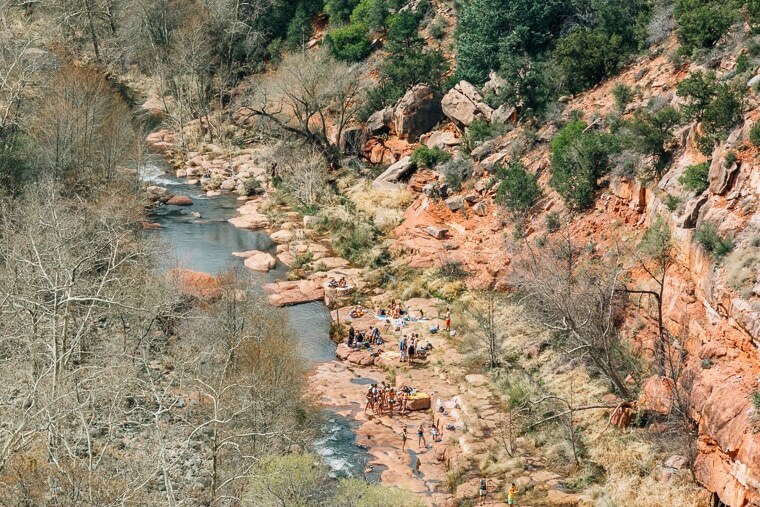 Either Slide Rock or Red Rock State Parks will probably be your best bets. It’s been a couple years since we were out there, but both have decent walkway from what we can remember. Which one is best for a couple who prefers solitude? The Crack, during the middle of the week, on a cooler, overcast day. 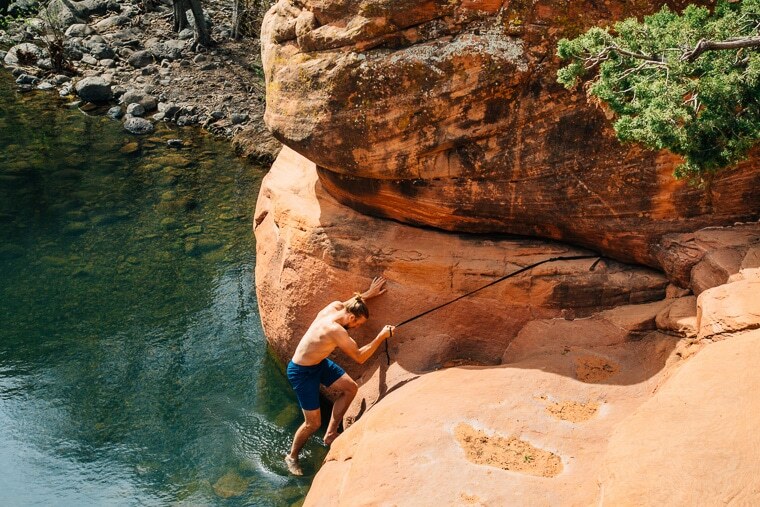 Unfortunately, the reality is that people in Sedona are very motivated to get in the water when it’s hot out. So you’ll probably have company no matter where you go. Love this post idea and will definitely refer back to it next time we’re in Sedona! These places look awesome. Been to sliderock and had one of the best days ever. All the best! My parents are elderly, looking for a place for us to wade in and super easy to walk to. None of them are super accessible, but Slick Rock State Park might be your best bet. Totally using this for today’s adventures in Sedona, Megan and Michael! 🙂 Thanks! Enjoy, Amanda! Sedona is such an awesome spot. So happy that you found this useful. Hope that you had a wonderful trip over the weekend! Hi, we are planning to drive out to Sedona in late July. Thanks for your wonderful blog. One question though – how’s the water level in Summer? Is there enough water to swim and enjoy these holes in Summer? So we visited Sedona in March and the water levels looked pretty good, but we haven’t been back this summer. We assume the water level probably drops a bit, but we’re not exactly sure how much. We have heard from a lot of people, though, that they’ve gone swimming there in the summer. So there are at least a few spots that are swimmable. Do you know of any of these swimming holes doesn’t allow dogs? We’re looking to vosit but will have our pup with us. I know slide rock doesn’t allow them but wasn’t sure about the others. Thank u!!! Looks like Slide Rock and Grasshopper point are definitely out, but the others may be OK as long as your pup is leashed. I am not sure if Red Rocks Crossing is technically IN the state park or not, but if it is, looks like there’s no dogs allowed there, either. I’d say the safest bet is to check with the ranger office about the specifics. They’re usually pretty helpful! Enjoy your visit. Sedona is SUCH a beautiful place. Hello! 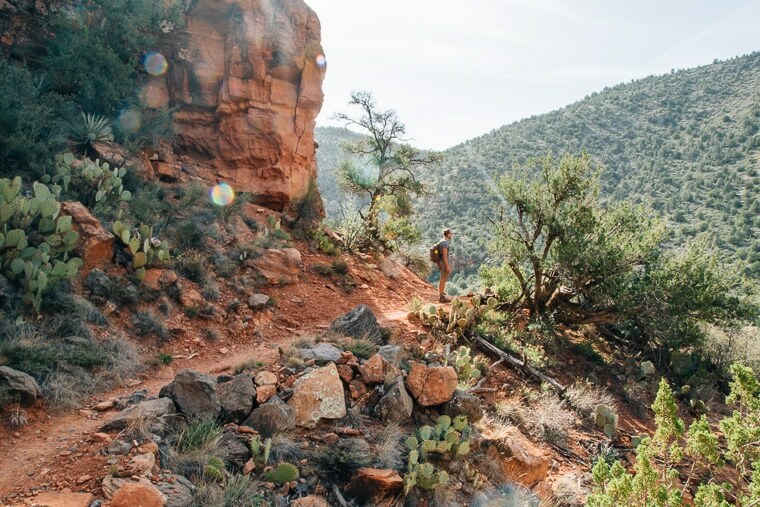 My partner and I are embarking on a road trip for a couple months this summer & Sedona is on the list of destinations – thanks so much for the refreshing spots to stop at. Quick question about Arizona heat, we’ll have a laptop on the trip for work, and I was wondering if you have any tips for how to keep your laptop cool enough during the trip to avoid a meltdown :). FYI, we’ll have a Skybox and are driving a Toyota Matrix. I really appreciate the advice! Thanks! Nice, enjoy enjoy Sedona (and the rest of your road trip)!! Regarding laptops – we don’t actually keep them (or any electronics) in our topbox exactly for the reason that the box gets VERY warm inside, even if it’s not summer in the desert – we store everything in the car out of direct heat. We use one of those windshield reflectors, always park in the shade (even if it means a longer walk), and we recently bought WeatherTech window rain guards, which means we can keep the windows cracked a bit without having to worry about people being able to break in (you can’t really even see that the windows are cracked open). So, nothing too revolutionary but it’s worked so far!! Oh my gosh, I totally loved this post. I’m from Arizona and have been to Sedona a handful of times, but seeing it through your photos makes it seem even more beautiful! I want to go back now! This post is giving me all those awesome wanderlust feels, can’t wait to get up and get out and go! I can’t believe I went to Sedona and missed out on every single one of these beautiful spots. Slide Rock and Red Rock Crossing look unreal! Thanks so much for including the google map directions, definitely bookmarking this and saving it for our next trip out to AZ. Ugh, that feeling of “I was right there and didn’t know about that? !” is the worst – and something we’ve experienced more than a few times. Happy to hear you’ll be able to check them out next time you’re in AZ. Red Rocks Crossing was particularly picturesque (and we hear is less crowded than Slide Rock). Such beautiful spots! It makes me miss Arizona… I am from Phoenix but currently living in CO. I have only been to one of these, will have to check all of them out next time around. Thanks for sharing! Soo cool!! Im sure they get pretty crowded but your early season shots make them look soo serene!! 🙂 And high-five for avoiding those pesky parking fees! UGH I’m so jealous, those swimming holes all look heavenly. I went to a swimming in hole in southern CA (I can’t remember the name) and I just loved the fresh running water and rocks to jump off of. But my boyfriend and I have been talking about going to Arizona, so we’ll have to check these spots out! !